In April 2010, we launched the first SaaS Sunshine Act Compliance System to help Medical Device Manufacturers and Pharmaceutical companies enter and track the data they need to comply with the Physician Payment Sunshine Act. We are still the most advanced platform for your compliance needs! Add workflows to ensure your "transfers of value" are reported correctly. Our Physician Payment Sunshine Act compliance software is built on a flexible and powerful platform that can adapt to changes in the law and your business. Customize workflows, reports, dashboards and more with point and click simplicity. Understand your relationship with doctors better! 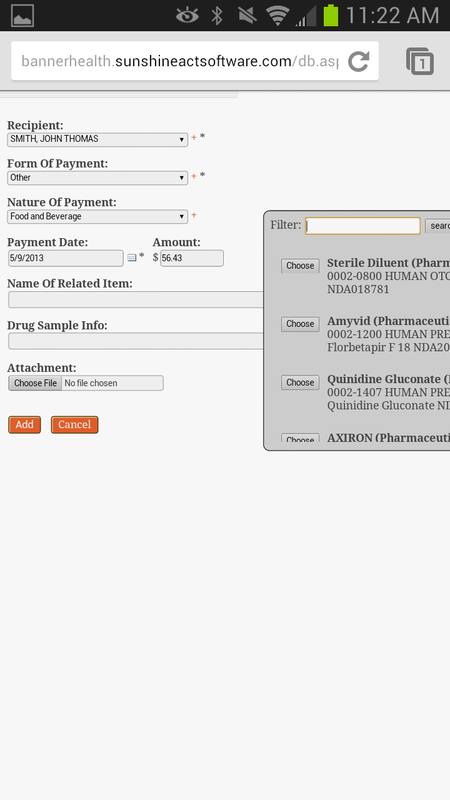 SunshineActSoftware.com simplifies the process of complying with the Physician Payment Sunshine Act, so you can focus on creating and selling great products! We even have a mobile web interface so sales reps can enter transfers on the road. Snap a photo and upload receipts too! When our company researched software programs to track the data necessary to be compliant with the Sunshine act we quickly found that most of the options available would only cover tracking a portion of the data that we would need to track and report. Then we found Mr. Minter, he used his incredible knowledge to create a custom tailored solution that we used to track and report all Sunshine act related data without having multiple programs. We wanted a solution that would track not only our employee’s expenses but also accounts payable that required reporting and we wanted it to integrate with our accounting system. Randall not only made it happen, he was always very quick to respond to our needs, questions, and helped with training our staff. He made it possible for us to file our first report on time and accurately with ease. I would use Randall again anytime I had a custom programming project or had a need to report Sunshine Act data. I would also recommend his company and software to anyone required to report Sunshine Act data. Sunshine Act Software became part of our team. The government site can be overwhelming, with a massive amount of reading and details to wade through. The Sunshine Act Software helped bridge the gap between our systems and the government site. We surveyed about a half-dozen other options. They were expensive with features we had little need for. This program is customizable and easy on the eyes. Any questions were quickly answered, our company was compliant and we saved lots of money. We have really enjoyed working with you! I will definitely keep you in mind for creative problem solving related to software. I think you are very talented with what you do and combined that with a knowledge of what is needed for the business was very helpful. I took care of the submission and attest action this morning. We can't thank you enough!!!!!! The problem was related to a few bits of data, but also a configuration issue inside the CMS Portal we were able to help the customer resolve at the very last minute. It was a sweet victory for everyone involved. Data you compile into reports to upload to the CMS come from several sources. We can automate much of the process and simplify the lives of your employees by letting them enter data just one time then exporting that data to other systems in your organization. For example, your sales reps can enter their expenses into our nifty iPhone app and upload receipts. That data is then copied over to to General Sunshine Transfers and they can just pick the doctors who were at the meeting and enter a few more pieces of data the government requires but your accounting team does not. They won't need to re-enter data multiple times into multiple systems so you can be compliant. Everyone saves time and the whole process becomes much simpler to manage. You can even create custom rules so expenses flagged as Sunshine reportable are denied until recipients, products, or travel destinations are selected. This data is all then compiled automatically into the proper government formatted CSV upload files that you can download and upload yourself -- or we can do it for you if you nominate us as your data submitter. Our expense reporting system can simplify the Excel spreadsheet process many companies still use today. You can approve and deny individual expenses to keep the reimbursments flowing quickly. You won't need to hold up an entire expense report because the Sales Rep forgot one receipt. Reimburse what you can verify today and then, when the sales rep gets you the information you need, reimburse the rest. We can also integrate multiple levels of approval hierarchy so regional sales managers can deny and approve expenses before they go to accounting. Your business becomes more scalable instantly and you can make more people healthier more quickly. You can also export data from Sunshine Act Software in properly formatted transaction files to import directly into QuickBooks or other accounting systems. 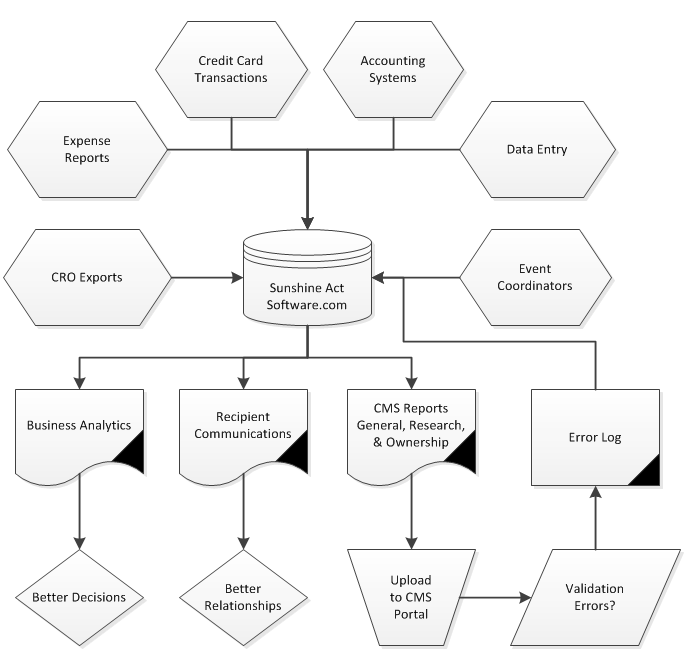 Expenses are properly coded according to the Chart of Accounts to simplify reporting. We even let you code expenses as being realized at a future date so you can better understand how that marketing spend affects the performance of your business. Our preupload validation tool makes it very easy to stay on top of data that is missing or known to cause problems with the CMS's validation routines. You can quickly navigate to records that need corrections or extra data entered and fix known problems before you upload the data. Occasionally we still see validation errors after uploading the data, but this cannot be prevented with larger data sets, because the the CMS validation routines use proprietary data to verify the accuracy of recipient information. Their data does not always match the data about recipents that is publicly available or that is entered manually by your team. For example, if a license number for a doctor is entered incorrectly, the CMS will generate an error log. With any data integration process as massive as Sunshine Act Reporting, you can almost always expect an error or two in the communication. What you really need is a system that can simplify the understanding and correction of those errors to reduce the time it takes to comply. The error codes generated by the CMS are difficult to understand and have limited information in the error logs that make it difficult to find and correct problems. 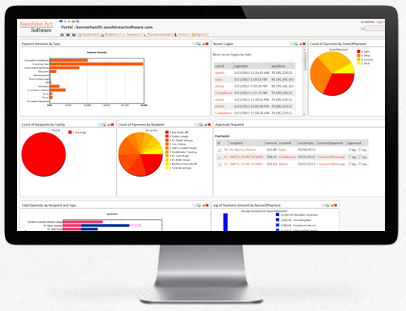 Sunshine Act Software makes it easy to import those error logs, map the codes to descriptions and the records with the problem. Sometimes multiple errors will be generated for the same easy to fix issue. It may be as simple as correcting a typo on the zipcode for a recipient's business address. Just click the record number indicated with the error, identify and correct the problem, then re-upload the file. Part of the way we make this simpler is by associating recipient data to spend records in such way that you can make a change to recipient information and that change is automatically reflected through all transactions you upload to the government. If you were managing this data in the CMS Portal directly or using Excel (gasp!) you'd have to update every transaction record with the correct recipient data. Of course, this becomes quite time consuming if you aren't using an advanced master data mangement system like Sunshine Act Software. 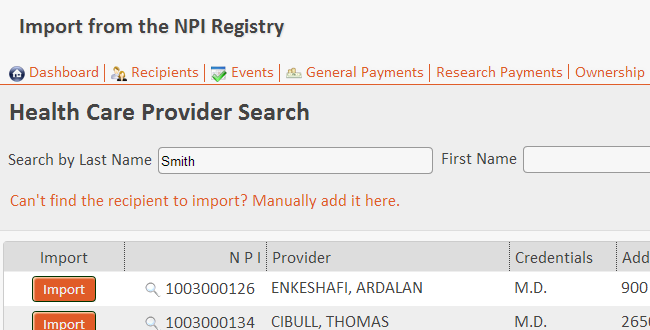 Something that takes a just a few clicks in Sunshine Act Software requires navigating through 5 or more screens in the CMS portal -- for every single transaction associated with that recipient. With us, it's one and done! One of the differentiators we offer our customers: A simple product that solves just your exact problem. We give all of our customers what they want inside their own Software as a Service. You don't see all the features we share with all customers if you don't want them. You can get new features you want without having to wait on us to integrate it with everyone else's system too. That's the advantage and it's our key to simplicity. We take a complicated problem and boil it down to exactly what your team needs. Already have an expense reporting system? Use that. Don't have one, use ours! Our software platform was built from the ground up to be flexible and adaptable to the individual needs of each customer. We want you to be our customer. Please contact us today.